Juniper is native to many places around the Northern Hemisphere, and its berries have been used as spices, food, and medicine. Its peculiar flavor has also found praise among liquor connoisseurs. The use of juniper as an herbal remedy can be traced back thousands of years. It was commonly used by the Romans, as well by several Native American tribes, for its medicinal properties. Today, juniper is best known as the main flavoring agent in gin, but it still provides many useful health benefits. Relieving edema. Juniper has long been used as a diuretic and can help reduce buildup of fluid in the body. Treating urinary tract infections. Its diuretic effects along with its antimicrobial properties may help to flush out bacteria that cause urinary tract infections (UTIs). Treating gastrointestinal upset. Juniper is thought to aid digestion. The most important component related to juniper's diuretic properties is terpinen-4-ol, which induces urination in the body and can help to flush excess fluids out of the body. Research also indicates that there may be other compounds in the plant that contribute to its diuretic effects; however, those chemicals have not yet been identified. Juniper's alpha-pinene, beta-pinene, sabinene, and mircene are all terpenes with strong antimicrobial properties, and they have been observed to be effective at killing several different bacteria, which corroborates juniper's ability to help treat urinary tract infections (UTIs). The essential oil of juniper has particularly high concentrations of these components. The gastrointestinal effects of juniper have not been studied, but because juniper is a bitter herb, it is thought to have the same effect on the stomach as many other bitter herbs, including aiding digestion by increasing the amount of acid in the stomach. Herbs that also reduce edema are horse chestnut ans celery, whereas cherry and echinacea are traditionally used for treating urinary tract infections. Juniper berries are likely safe when consumed as a flavoring ingredient in a food or beverage. However, supplements contain much higher concentration of juniper and should be used with caution. Extended use or excessively high doses of juniper supplements may cause serious side effects, such as kidney irritation or seizures. The essential oil may also cause a rash when applied directly to the skin. Juniper may interact with diuretic drugs. Additionally, those who suffer from kidney inflammation, kidney failure, or diabetes should avoid using juniper, as it may worsen these conditions. Women who are pregnant or breastfeeding are similarly advised not to consume juniper. A doctor should be consulted before using juniper as a supplement, especially if it is intended to treat symptoms of a UTI, as other antibiotics are likely to be more effective against an infection and should be the primary method of treatment. Juniper is rarely consumed raw; it is much more commonly used in medicinal preparations or mixed with foods and drinks. Tea. Juniper berries can be steeped in hot water to brew tea, which is useful for stimulating urination and treating UTIs. Tincture. A few drops of tincture made from juniper berries can help to eliminate fluid buildup in the body. Capsules. Capsules are a quick and simple way to benefit from juniper in controlled doses while also avoiding its bitter taste. Juniper capsules can help increase kidney action. Essential oil. Oil distilled from juniper leaves and berries is available, and it is often consumed as a diuretic, but because of irritants present in the oil, it is recommended to seek a doctor's advice before consuming the oil. Juniper is not often consumed alone because of its extremely bitter taste, but some people will eat the berries for their ability to stimulate the kidneys. Juniper berries are also popularly used as a flavoring agent. They are most commonly used in gin, but may also be added to some beers or used in a sauce for meats and vegetable dishes. While not common, juniper berries can be found in some grocery stores, especially in areas where juniper plants are grown locally. They may also be found in some local markets in these areas. Medicinal supplements made from juniper berries are widely available via many online retailers, and certain preparations may also be found at small herbalist stores. Juniper plants are shrubs that may grow either prostrate or erect, depending on the variety. They can be commonly found in the wild in many temperate parts of the Northern Hemisphere; however, they can also be cultivated in a backyard. Juniper can be propagated either by cuttings or by seeds. Seed propagation can be more difficult, but will result in greater genetic diversity of the plants grown. Plants will grow best if kept in containers indoors for at least one year before being transplanted outside. Seeds harvested from juniper berries must be stratified, or exposed to winter-like conditions, in order to germinate. Juniper grows best in a temperate climate. Juniper should be planted in full sunlight, in chalky or loamy soil that has adequate drainage. Too much shade can seriously damage the plant's growth, but juniper can withstand partial shade. Although juniper can thrive in soil with a wide range of pH values, it prefers soil that is either acidic (pH of 5.0 – 5.5) or alkaline (pH of 8.0 – 8.5). Fertilizers that contain phosphorus may be beneficial to young juniper plants. Nitrogen-rich fertilizers should not be used. Space to grow is essential, so juniper seeds or cuttings should be planted at least eight feet (2.5 m) apart. Weed control is crucial for the growth of juniper seedlings; weeds can both compete for nutrients with juniper and provide too much shade, thus damaging the plant. Junipers are unlikely to need pruning. The most likely pests to damage juniper are aphids, juniper scale, and caterpillars. Junipers are susceptible to cankers. The juniper plant is officially a shrub, but in appearance it can be similar to a small tree. The upright varieties can grow 13 - 30 feet (4 - 10 m) high, and the plant can survive altitudes of more than 9,850 feet (3,000 m) above sea level. It is usually recognizable by its green spine-shaped leaves and deep purple berries. The juniper berry is actually a small seed cone, but because of its soft, round appearance, it is colloquially referred to as a berry. Juniper, or Juniperus communis, belongs to Cupressaceae, or the cypress family, which contains over 25 genera and more than 130 species of coniferous plants, including the famously large and long-living redwood tree. There are several different varieties of juniper, most of which are specific to different areas and thrive under slightly different conditions. For instance, J. communis var. communis is native to most of Europe, while J. communis var. depressa is found in North America. Additionally, J. communis var. hemisphaerica grows in the Mediterranean mountains, and J. communis var. nipponica is native to Japan. Juniper is native to much of the temperate Northern Hemisphere, and it has a long history of use by the Greeks and Romans. It is first thought to have been used to create gin in the 17th century, and since then, it has been popular for its integral role in the production of that alcoholic drink. Juniper is mostly not an economically-significant plant. It is widely used in the gin industry, but because juniper is used for very little else besides herbal remedies, there is no widely-available economic data about the plant. In many Native American medicinal traditions, juniper berries were believed to be useful as a contraceptive. Juniper bushes are too small to produce any economically-useful yield of lumber. However, the wood is especially strong and is commonly used in parts of Europe in small woodworking projects. 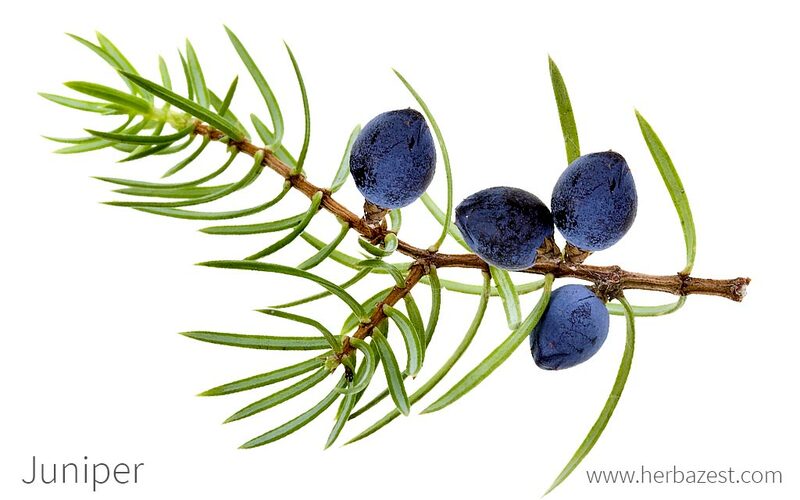 The oil from the juniper plant is also commonly used in soaps and fragrances for its distinctive aroma. Juniper is popular for its pine-like flavor in gin, but it can also be useful as an herbal remedy for its strong diuretic and antimicrobial properties.